Don Bosco Child Labour Mission remembered Mahatma Gandhi on his 149th birth anniversary on October 02, 2018. 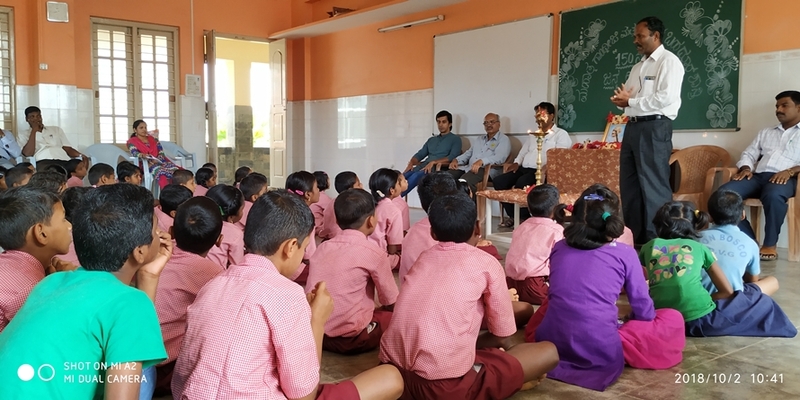 A small gathering and a swach shramadana of the staff and students were organized to commemorate Gandhi Jayanthi and mark the beginning of the 150 th birth anniversary celebrations in the next year. They also combined Fr Jose Joseph (Administrator), Mr Ramnaik Y (CWC Chairperson, Davangere), Mr Kotresh (Coordinator, Childline Project), Mr Manjunath B (State Coordinator, CREAM Project) and Mr Sunil H (Coordinator, Open Shelter Project) were guests of honour. The programme started with paying floral tribute to Gandhiji by the student representatives. The speeches by the guests included a life sketch of Gandhiji and the listeners were exhorted to make Gandhi their role model. While stressing on the immeasurable contributions he made to the country they spoke about the values he held high. As part of the celebration a swach shramadan also was organized to help the children in cultivating the habit of cleanliness. The children and the staff pledged to be a part of the cleanliness drive of the country and took part actively in the shramadan. The whole programme ended with lunch at 01:00 pm.